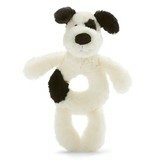 The Bashful Black and Cream Puppy Grabber is scrummily soft and a brilliant first pet. A splotchy pup who just loves to play and with a little jiggle he'll rattle away! Babies will love his cute patchy face, and his cloudy-soft fur. Just the right size for small hands to hold, he’s sure to become a much-loved first pal.